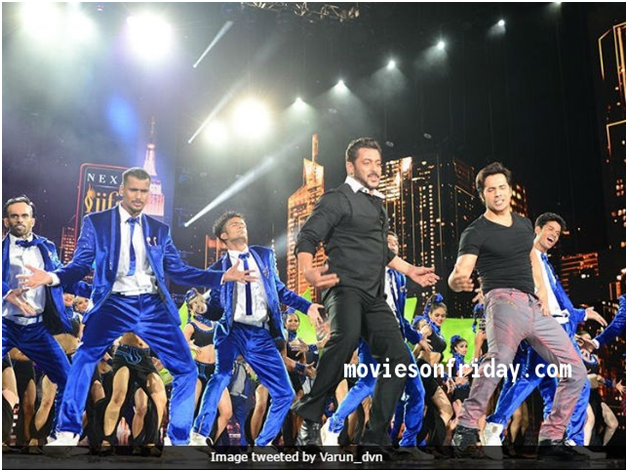 The International Indian Film Academy Awards (IIFA) 2017 was held in New York’s Metlife Stadium, where the stars and celebraties from B-Town were gatherd to enjoy the hot and energetic performences, perfomered by Bollywood Celebs and Super Stars like “Alia Bhatt”, “Varun Dhawan”, “Salman Khan”, “Katrina Kaif””, Shahid Kapoor” and many more. The IIFA AWARDS 2017 best actor(female) Alia Bhatt was all set to spread her hotness to the IIFAA audiences. She gave some splendid performances like shaking legs with “Varun Dhawan” and singing with “Diljit Dosanjh”. The Super Star “Salman Khan” and “Varun Dhawan” moved there leges and Shake their body on the famous “Judwaa” song “Tan Tanatan Tan Tan Tara” and The Judwa Face-off between Bhai and Varun was awesome, everyone was enjoyed that ironic moment. The song “Tan Tanatan Tan Tan Tara” will be the part of Varun’s upcoming film Judwaa 2, which is the sequel of Salman Khan’s Judwaa. The hottest Diva of Bollywood “Katrina Kaif”. She set the stage on fire with her sizzling moves on “Kamali” and “Dhoom Macha Le” and takes every one’s heart out there. The Punjabi Star “Diljit Dosanjh” gave a rocking performance to the IIFA 2017. Diljit Dosanjh Punjabi swag won audience attention. The Raabta pair Sushant and Kriti put up an entertaining and energetic performance and heat the environment of the box office with their superb chemistry. The IIFA 2017 Best Actor finishes the IIFA 2017 night with his super charged performances. We all know the how good dancer he is, and once again he proved that statement right.